White Eggs, Brown Eggs, Graded Eggs - They're not just for Easter! This is great news! For years I've failed to bring my cooking into conformity with "heart-healthy" standards of 3 eggs per week. I mean eggs are so versatile, so delicious, and so useful. You can froth them or fry them, scramble them or flip them, whip them or beat them. You can quiche them or souffl� them, omelet them or bake them. I felt hard-pressed to find a recipe that didn't call for an egg or two, thus I pretty much gave up trying to minimize my family's egg consumption. Luckily, my loved ones are going to be okay because while eggs do contain a large amount of dietary cholesterol in the yolk, this does not necessarily translate into a higher blood cholesterol. Fit into a balanced diet (one that is low in saturated fat) eggs share the benefits of the highest quality protein and nutrient-dense "fast food" that money can buy. Eggs are categorized according to size and grade. 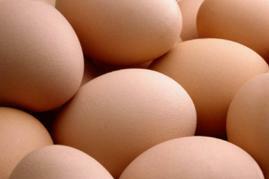 Most tested recipes use the large (2-oz) size, though eggs are available in jumbo, extra large, medium, and small sizes. In many recipes, different sized eggs can be used interchangeably with good results. However, when making "fancy" recipes, like souffl�s, use only the specified size egg (or a volume equivalent) to prevent throwing off the recipe's balance. Egg grades measure the quality and appearance of both the exterior and interior of an egg. Eggs graded AA and A work best in foods where appearance matters, such as poached, fried, and deviled egg dishes. The yolks in these top-grade eggs are round and centered, while their whites are firm and thick. Eggs with grades B and C (seldom available) carry flatter, off-centered yolks and thinner whites. These are best suited for baking purposes or scrambling where you don't need an "attractive" demeanor. Actually, the only difference between these eggs is the color of the shell. The species of the mother hen determines whether the egg will be white or brown. What the hen eats, though, determines the color of the yolk. Dark yellow yolks indicate diets of corn and alfalfa, while pale yellow yolks point to wheat. When hens enjoy white cornmeal, marigold petals liven up their menu to give their yolks a splash of sunshine. The color of the yolk does not indicate freshness, quality, or nutritional value. Cooks often deal with more than white, brown, or yellow when it comes to eggs, though. Does the green yolk in some boiled eggs enliven your appetite? Most likely not. Yolks turn green when they are cooked at high temperatures, overcooked, or not cooled fast enough (and sometimes if there is just too much iron in the water). Scrambled eggs change colors, too, for these same reasons. Prevent scientific reactions in your eggs by simmering them gently (instead of boiling) for the correct time, and then cooling them quickly under cold water when done. Scramble your eggs at a low temperature and serve as soon as possible. If holding is necessary while you wait for brunch guests to gather, then warm scrambled eggs over a pan of hot water instead of directly over the heat source. Eggs contribute so much in the realm of cooking. In baking, they provide richness in flavor, enhance color, and create a tender texture. They also work as a leavening agent in cakes, as a thickener in custards, soups, or sauces, and as an emulsifier in dressings. Additionally, soups benefit from the clarifying effect of eggs. Boiled candies and frostings use eggs to inhibit sugar crystallization, while baked goods glisten and sparkle when glazed with egg washes. Finally, salads, sandwiches, casseroles and other entrees delight in garnishes made from hard-boiled eggs. Throughout this newsletter, look for the kitchen tips to get the most out of the eggceptional and eggcellent egg. *Please note: these researchers found that egg consumption in individuals with diabetes was associated with coronary heart disease. Thus, diabetics may wish to monitor their egg consumption.